Camels look handsome- but only from far away. When they smile, they have a face that only a mother could love. This was my first thought as I walked up to the honey colored animal kneeling on the sand in the Sahara Desert. Although beauty was definitely not its primary feature, it did look regal in a way, and also appeared to be quite friendly. I lifted my leg up over the side of the saddle that draped across the camel’s back. #1 You don’t actually see or feel the hump of a camel when you are riding it. I always expected to sit on the hump in some uncomfortable fashion, but someone had managed to pad the camel in such a way that the hump became part of a large rounded saddle. We sat on that saddle, holding on to some handle bars near the camel’s neck. I happened to be at the front of the caravan, so I was the first of my party to experience standing up. #2 Camels standing up could be considered a mini rollercoaster ride. The camel driver, a tall tan man with a large turban wrapped around his head, told me to hold on. 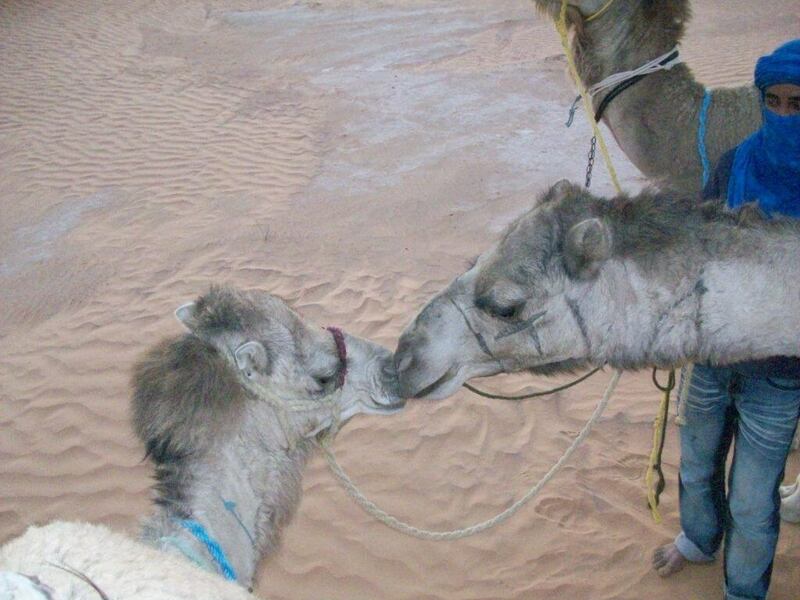 With a sudden jerk, I felt and saw the camel lean forward as it straightened its back legs first. This strange way of standing pushed me forward for a split second. Then, as it straightened its front legs, I rocked backwards before arriving up at my final destination. I laughed as I watched the people behind me have the same experience. Once we were all up, we started on our way. #3 Whoever called a camel the “ship of the desert” was right. When the camel walked, it swayed back and forth in a very calming manner. It did feel similar to the gentle rocking of a boat. As soon as I got comfortable and settled into this new rhythm, I looked out to see the view. #4 There is no better way to see the desert than from the back of a camel. The sight of the Sahara was amazing. Rolling sand dunes as far as the eye can see stretched out into the horizon. The dunes’ golden brown peaks contrasted with the perfectly blue sky. As the wind blew, I could see specks of sand blow off the dune in a spray only to join another portion of the giant sandbox. #5 You can ride a camel side saddle. I watched as one of the guys in my group shifted his legs so that both legs were on one side of camel. He smiled and happily continued his conversation with the person on the camel behind him. Who would have thought?! I changed my position as well and found that it was quite comfortable. #6 When looking at the stars from the desert it feels like you’re looking through a telescope. At the campsite, we descended from our camels (which was an experience of its own), and walked into a charming camp surrounded by desert trees, sand dunes and Berber tents. I loved the food we ate for dinner! As I sat on the Moroccan rugs on the sand, I looked up at the sky that was glowing with constellations. All the stars seemed to try and outdo each other with the bright far away beauty. #7 I am coming back to the Sahara!